Happy Solemnity of the Most Holy Body and Blood, Soul and Divinity of Jesus Christ, our Lord and God! What a Gift we celebrate today! The Eucharist is everything. It’s all things, the fullness of life, eternal salvation, mercy, grace, happiness, etc. Why is the Eucharist all this and so much more? Simply put, the Eucharist IS God. Period. Therefore, the Eucharist is all that God is. In his beautiful traditional hymn, “Adoro te Devote,” St. Thomas Aquinas writes, “I devoutly adore You, O hidden Deity, truly hidden beneath these appearances. My whole heart submits to You, and in contemplating You, it surrenders itself completely. Sight, touch, taste are all deceived in their judgment of You, but hearing suffices firmly to believe…” What a glorious statement of faith in this wondrous gift. This statement of faith reveals that when we worship before the Eucharist, we worship God Himself hidden under the appearance of bread and wine. Our senses are deceived. What we see, taste and feel do not reveal the reality before us. The Eucharist is God. Throughout our lives, if we were raised Catholic, we were taught reverence for the Eucharist. But “reverence” is not enough. Most Catholics reverence the Eucharist, meaning, we genuflect, kneel, and treat the Sacred Host with respect. But it’s important to ponder a question in your heart. 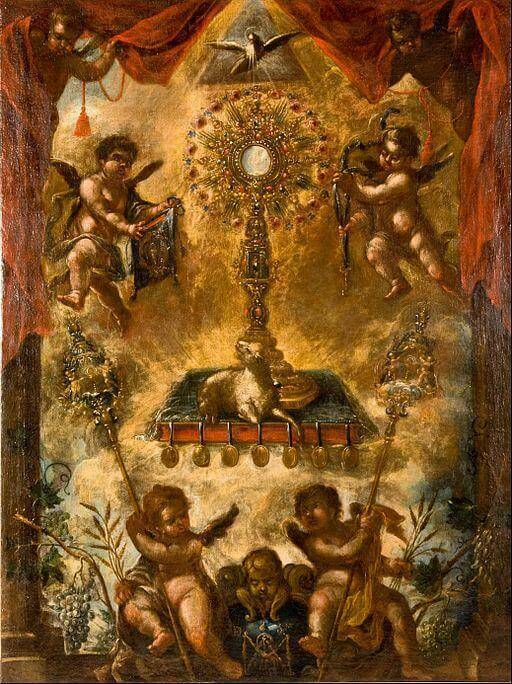 Do you believe the Eucharist is God Almighty, the Savior of the world, the second Person of the Most Holy Trinity? Do you believe deeply enough to have your heart moved with love and profound devotion every time you are before our divine Lord present before us under the veil of the Eucharist? When you kneel do you fall down prostrate in your heart, loving God with your whole being? Perhaps this sounds like it’s a bit excessive. Perhaps simple reverence and respect is enough for you. But it’s not. Since the Eucharist is God Almighty, we must see Him there with the eyes of faith in our soul. We must profoundly adore Him as the angels do in Heaven. We must cry out, “Holy, Holy, Holy is the Lord God Almighty.” We must be moved to the deepest of worship as we enter into His divine presence. Ponder the depth of your faith in the Eucharist today and strive to renew it, worshiping God as one who believes with your whole being. I devoutly adore You, O hidden Deity, truly hidden beneath these appearances. My whole heart submits to You, and in contemplating You, it surrenders itself completely. Sight, touch, taste are all deceived in their judgment of You, but hearing suffices firmly to believe. Jesus, I trust in You.